Once a realtor has their main website and mobile marketing in order, they should really look to the abundant options available online to promote their properties and their website(s). What Are The Benefits Of Real Estate Agents Blogging? It produces a ton of search engine friendly content and increases your SEO surface area. It gives your agency content that can be shared in Social Media. It allows you to Add Value (especially with Tips/News/Educational content) to your prospects' house buying process. If you aren't personally using Facebook and Twitter yet, it's likely that you aren't using them for your Real Estate business either. At this point, not being involved with social media is a real detriment to any business. We've written a whole series on how small businesses can use Facebook and Twitter. 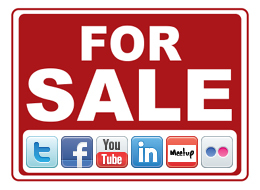 For more ideas on using Social Media in real estate, check out the links above. We cover social media heavily on this blog. Home buying is one of those processes where the more information you can get, the better. That's why getting prospects to Opt-In to an email list should be easy. If you respect the prospects and don't bombard them with emails, they will open, read, click through, and share your emails. If you are worried about coming up with content for your emails, refer to the list I provided above under blogging. We have also put together a great series of posts on using Mail Chimp, our favorite email marketing tool, to import your existing email lists, send email, track effectiveness, and send branded messages. In my next post, I will touch on my last 2 major web marketing opportunities for local real estate agents: Online Videos, and Advanced Website Features.